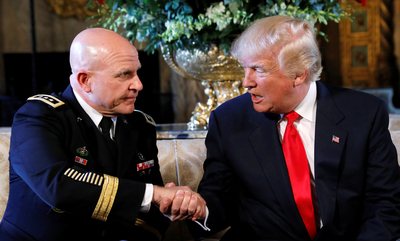 President Donald J. Trump and National Security Adviser H.R. McMaster shake hands. Matthew RJ Brodsky joins host Fred Fleitz, Senior Vice President for Policy and Programs at the Center for Security Policy, to discuss a range of Middle East issues on Secure Freedom Radio. They explore two of Brodsky's recent articles, Qatar's Dirty Hands in the National Review and A State Department Gone Rogue on Iran in the Jerusalem Post. According to Brodsky, when it comes to America's Iran policy not only is the State Department failing to provide President Trump options on how to handle the nuclear deal but the circular firing squad in the White House and NSC is preventing the completion of the Iran policy review, which leaves the administration without a net if it pulls out of the agreement. He also explains Qatar's role in stoking the Sunni Islamist flames in Syria and Libya, even as it cozies up with Shia Iran.